One chimpanzee, named Eve, has been shot dead, and the hunt is underway for her mate Adam, after the pair escaped their enclosure at a Spanish Zoo this week. Police have been authorized to kill the other escapee still at large, threatening to worsen an already tragic situation for a couple whose only desire was to be free. The incident began on Monday when Adam and Eve, held captive at Sa Coma safari park on the resort island of Mallorca, reportedly broke the bars of their cage and slipped out of the facility. Local officials launched a search for the animals, encountering Eve a few hours later. She was killed on sight. "[Eve] was very agitated and there was a risk that she might attack a member of the search party," a spokesperson for the Civil Guard told Agence France-Presse. "It wasn't possible to use tranquilizer darts because on animals that big it takes about five minutes to have an effect." As of Tuesday evening, Adam is still on the run. Authorities believe he may be headed for a wooded, mountainous part of the island where it will be more difficult to find him, reports Diario de Mallorca. The Civil Guard has said if Adam cannot be safely captured, he will be killed as well. Activists from Proyecto Gran Simio (Great Ape Project) are urging that mercy be shown for Adam, who "must be scared and unsure of what to do." They've also called for the closing of Sa Coma safari park over concerns of animal welfare. 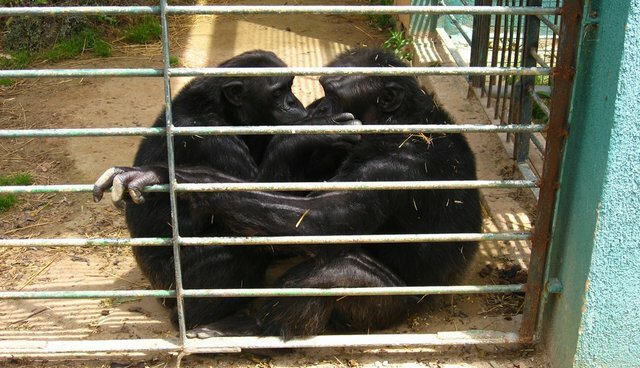 On the travel website TripAdvisor, the zoo is called "shocking" and "cruel" by some who have visited, with one reviewer describing Adam and Eve as "two chimps looking from a dirty cage begging for a bottle of water no room to play or move around." An investigation is underway to determine exactly how the chimpanzees managed their escape, but Guillermo Amengual, from the animal welfare group Animanaturalis, says their motive for fleeing is clear. "[Captivity] can cause a lot of stress in primates and not surprisingly lead to cases, like those of Adam and Eve, of chimpanzees trying to escape their cages and adopt aggressive attitudes," he told The Local Spain. "Animals in zoos can literally go crazy."